According to this FAQ page, the CPS interviews 50,000–60,000 households every month. Once a household enters the survey sample, it is interviewed once a month for four months, then left alone for eight months, then interviewed again, in the same four calendar months as before. The last of each quartet of interviews includes questions about how much household members worked and earned in the previous week. 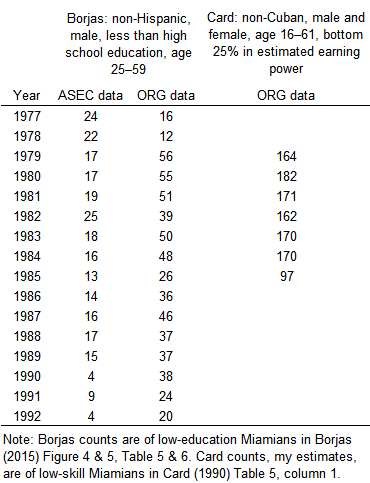 Since this information comes from people on their way out of a survey cycle, it is referred to as “Outgoing Rotation Group” data. ORG data undergird the government’s monthly announcements of job growth and unemployment rates. Because of the larger samples, analysis based on the ORG data seems more reliable. In addition, since the ORG survey asks about earnings last week rather than last year, it may be more accurate; on the other hand, weekly data can be noisier since some people’s earnings vary substantially week-to-week. Notably, the more dramatic results in the Borjas paper come from the smaller ASEC samples. I am not sure what this means. 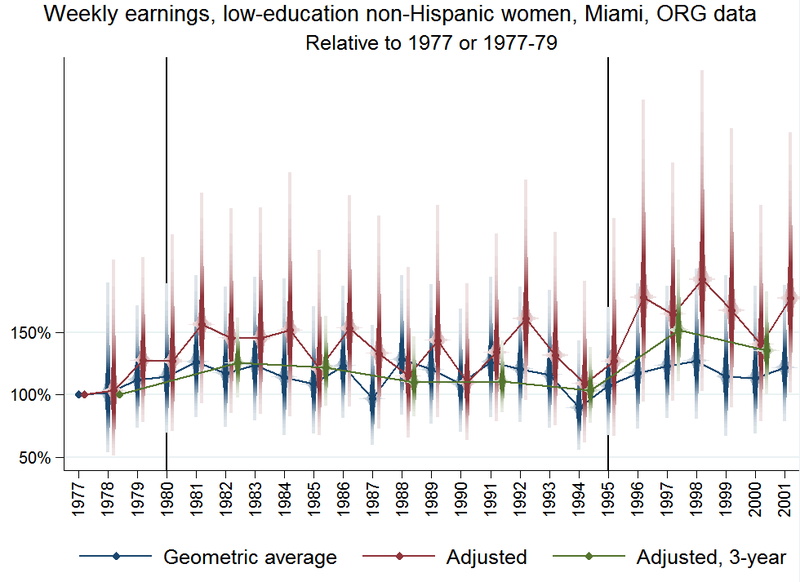 The idea seems to be that forces unrelated to the Cuban influx were driving trends in women’s earnings, and these could mask the effect of that influx. [Update, October 21: an email from Borjas appears to confirm this reading.] 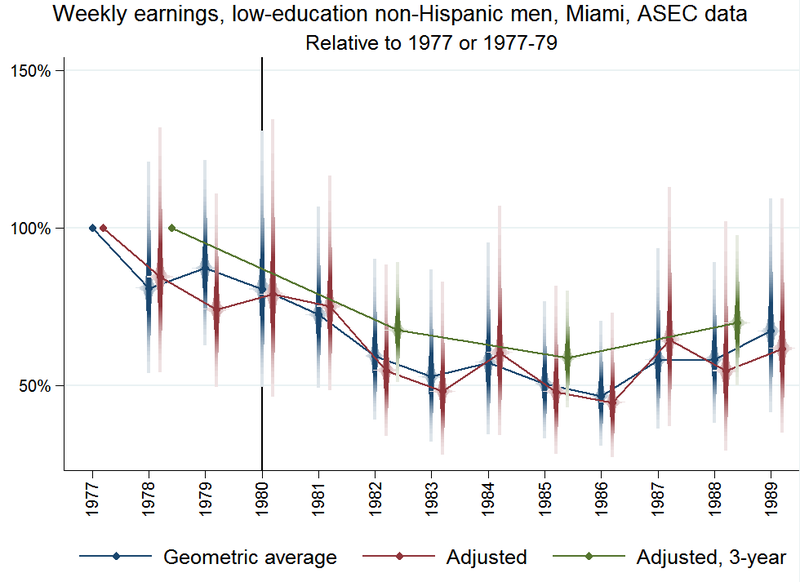 But similar things might be said for low-education men, whose earnings would have been influenced by broad events such as recessions and de-industrialization. Analytical devices such as benchmarking against control groups and focussing on changes immediately after the immigration influx should seemingly work as well for women as for men. It seems to me that Borjas’s methods will work as well or poorly for both genders, and that both merit attention. A third difference is that while Card reports annual figures, Borjas groups data into longer periods, in various ways. His graphs show three–year moving averages. 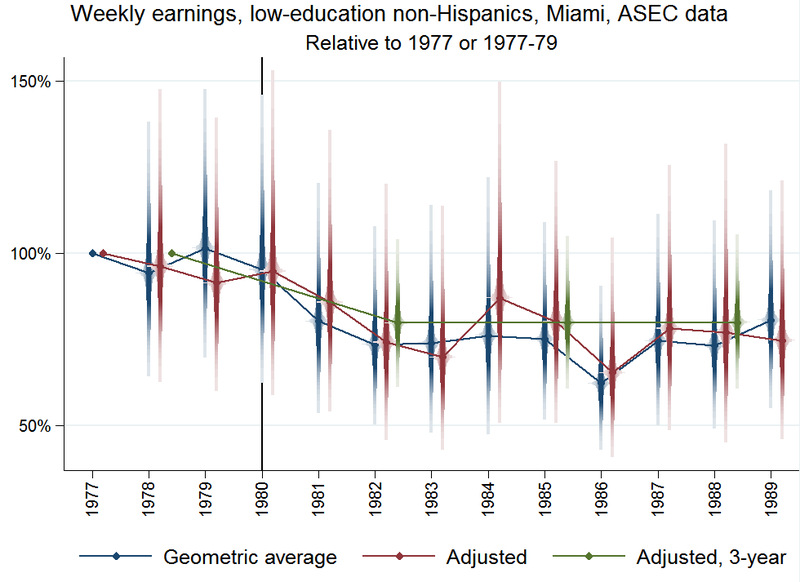 Some regressions (Borjas, Tables 5 & 6) compare 1977–79 to 1981–83 and subsequent three-year periods. 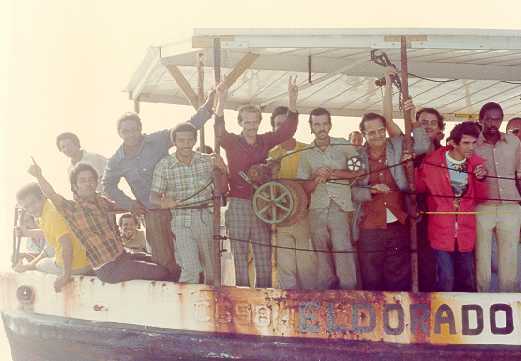 Others combine 1981–86 into a single “short-run” post-boatlift period. Put otherwise, Borjas appears readier than Card (or me) to attribute changes 3–5 years after the boatlift to the boatlift. I am unready because many forces buffeted the Miami economy circa 1980–an oil shock, extreme interest rates, two recessions, an influx of narcodollars, and a debt crisis in Latin America. To be fair, they affected cities in the control group too, but perhaps not equally. 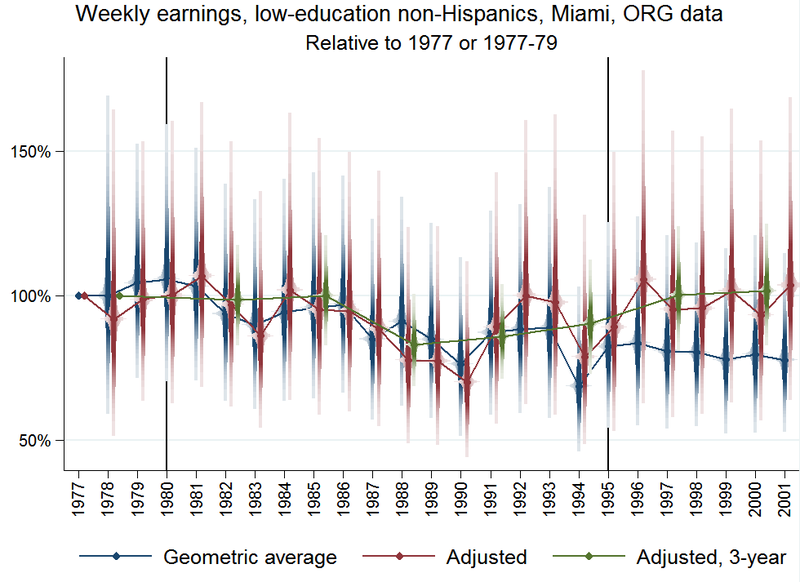 A relative wage drop 3–5 years after the boatlift seems to admit many explanations. To pierce the confusion, I made some graphs. They are designed to closely parallel Borjas’s statistical analysis—the samples, the control group, the control variables, the formulas for variables such as earnings—while breaking out the data by year. 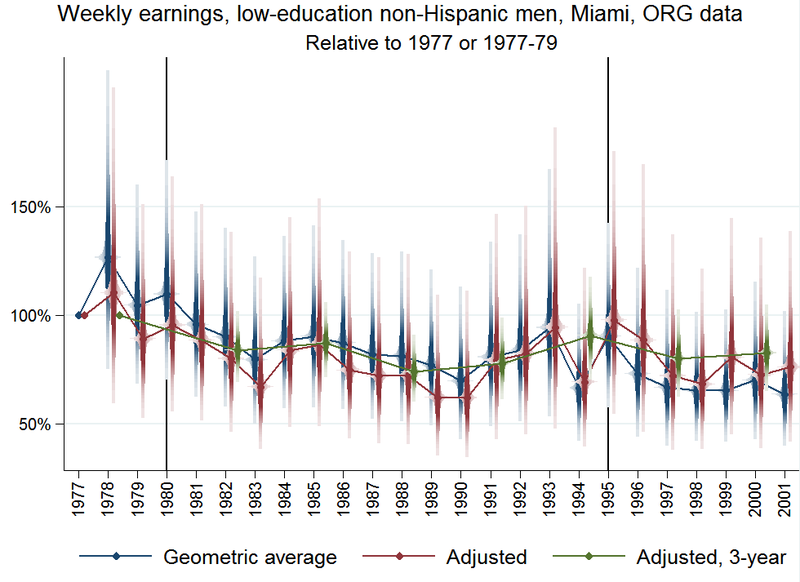 Has nobody in the history of the economics profession remembered what was happening in Miami to boost wages locally in the years immediately following the Mariel Boatlift of 1980? Has no economist ever watched “Miami Vice,” “Scarface,” or the new Netflix series “Narcos?” Ceteris was very much not paribus in Miami in the early 1980s due to the most famous Cocaine Boom in history. I did just read about how Marco Rubio’s brother-in-law was a drug dealer. 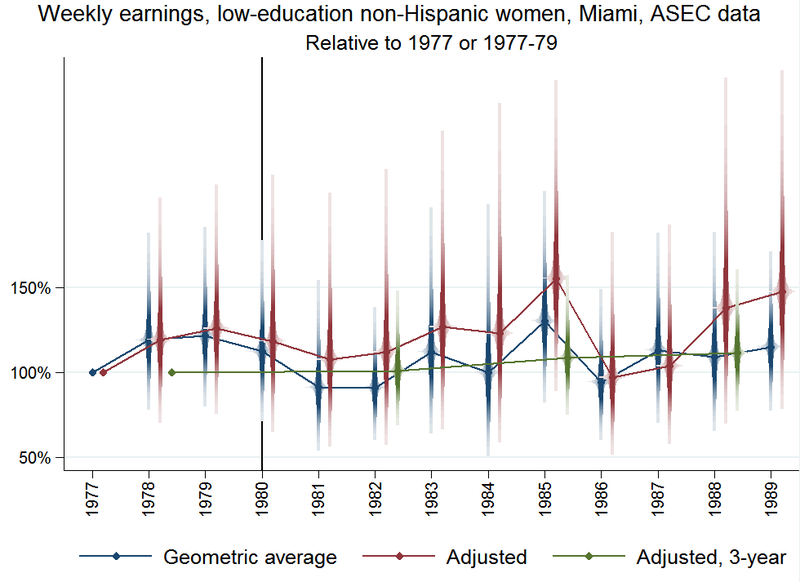 But I don’t see how anecdotal evidence like that or fiction would help me assess the impact of the Mariel boatlift on wages in Miami.